The Central Texas Conference has joined with Path One, the church planting movement of The United Methodist Church, to provide a church planting internship for the conference. This opportunity places a high-potential church planting pastor with a large-impact host church with the idea of strengthening the skills and experience of the pastor. At the end of the residency year, the pastor will be appointed by the conference to plant a new church. This year, Shea Reyenga was chosen to be the CTC's resident intern. Shea will be hosted by White’s Chapel UMC. Following his year at White’s Chapel, Shea will be even better prepared to pursue his calling as a new church start pastor. In the photo to the right, Scott Gilpin, executive director of Fund Development for GBOD, and Rev. 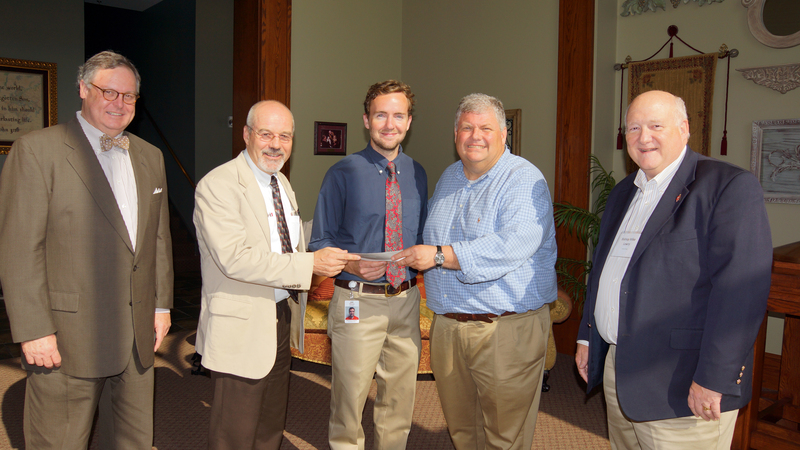 Douglas Ruffle, associate executive director, Path 1, present the grant check to Dr. John McKellar, senior pastor, White’s Chapel UMC, and Central Texas Conference Bishop Mike Lowry. Shea is the smiling young church planter in the middle. Path 1, the church planting movement of The United Methodist Church, is committed to encouraging and supporting the next generation of church planters. Path 1 believes young people are critical to the mission of reaching the growing number of unchurched people in the world and to stay relevant to the changing trends and needs of the world. In accordance with that commitment they are providing residencies for young adults who feel called to plant new churches. Path 1 is creating partnerships with annual conferences to fund these Residencies. The Residency program helps address the denomination’s need to increase the number of young and diverse clergy under 35 years of age. These Residencies are designed to help the UMC plant vital, new large impact churches with a relevant, contextual, outward focus on ministries and mission. The partners involved in this program are the planter resident, the host church, the annual conference and Path 1. The host church will act as the temporary employer of the resident while the annual conference and Path 1 will serve as co-sponsors of the program. Each sponsor will contribute money, time and resources to the program and evaluate the effectiveness of the planter, the Residency program and the fund development process.